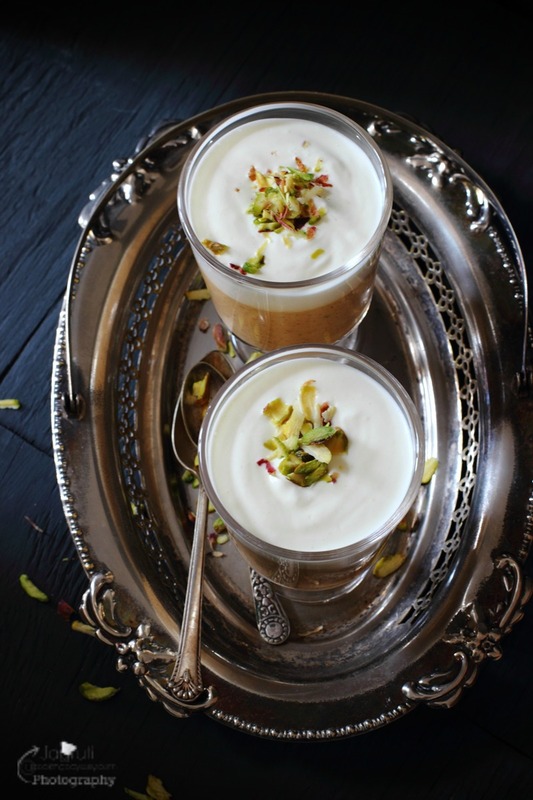 Get creative in the kitchen and indulge your dad's sweet tooth with this extra special Creamy Caramel Phirni. In honour of the Father's Day Celebrations, I have an elegant looking dessert idea for you today because every celebration calls for a delicious treat. 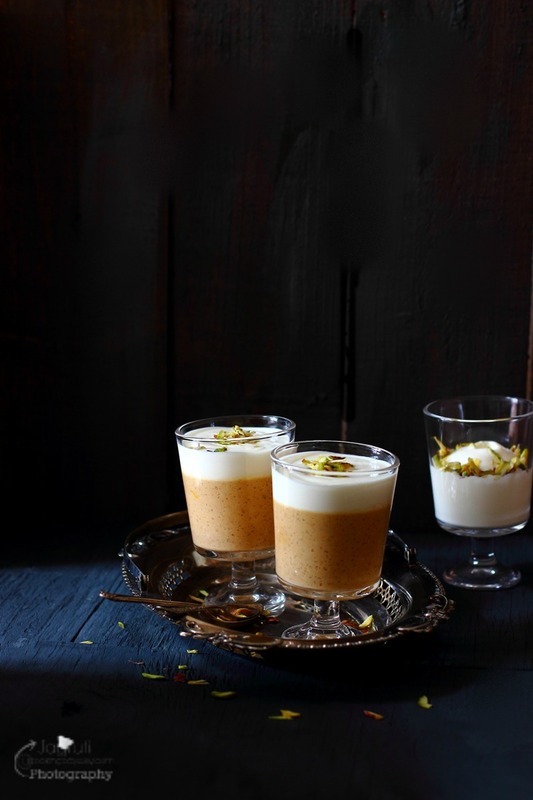 This creamy and scrumptious, caramel phirni makes a great dessert, served in individual glasses. So if you are looking for a simple treat with a super delicious twist, I've got you covered. 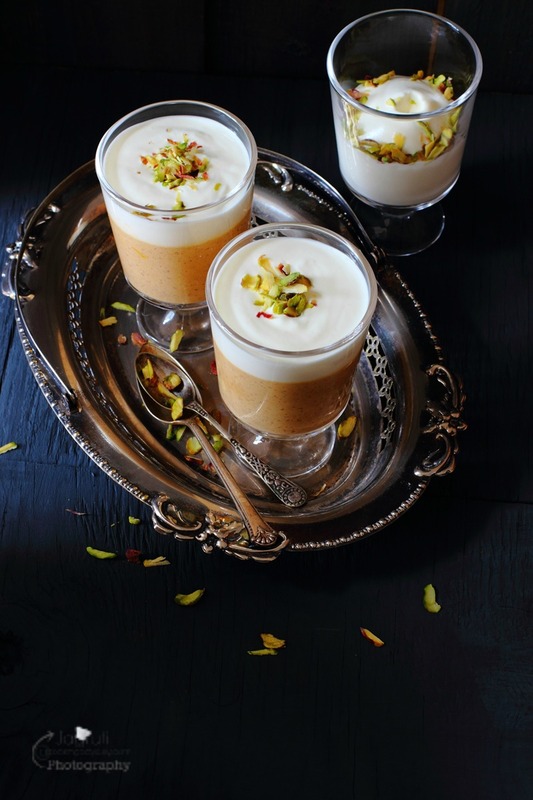 Phirni is an absolutely delicious traditional creamy Indian dessert, prepared with rice flour or ground rice, milk and sugar and set in a small earthen pots, garnished with nuts, edible silver leaf and rose petals. 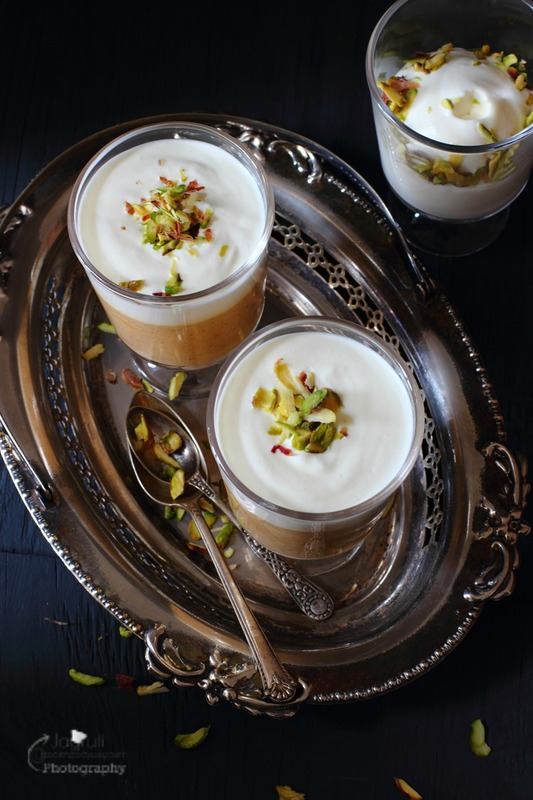 Creamy Caramel Phirni gives a western and modern twist to the conventional Phirni. To bring new flavours, I did not used any different or new ingredients but just changed a little method in preparation and here I have totally new flavoured Phirni. 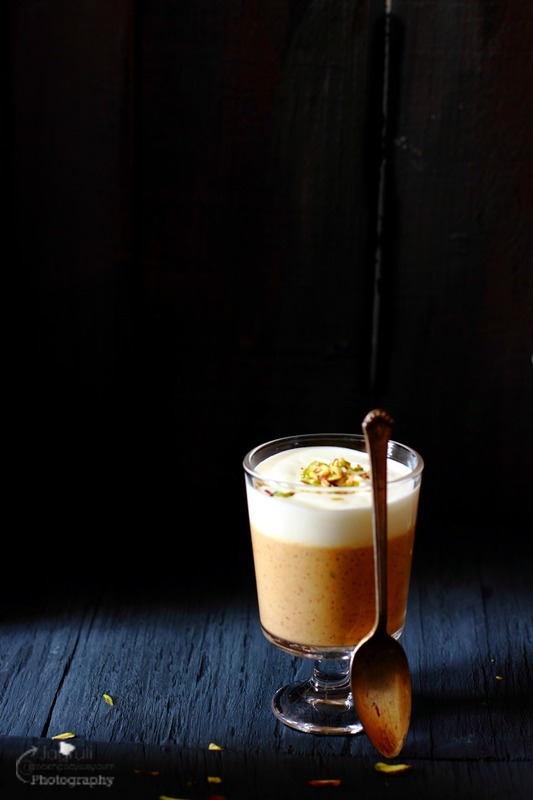 Really all I can say that this Creamy Caramel Phirni is so good, and even more simple to make. JCO wishing all the loving fathers out there a very happy day, have fun and enjoy the day ! I would like to wish a very happy father's day to my My Hero - My dad , and to my husband. 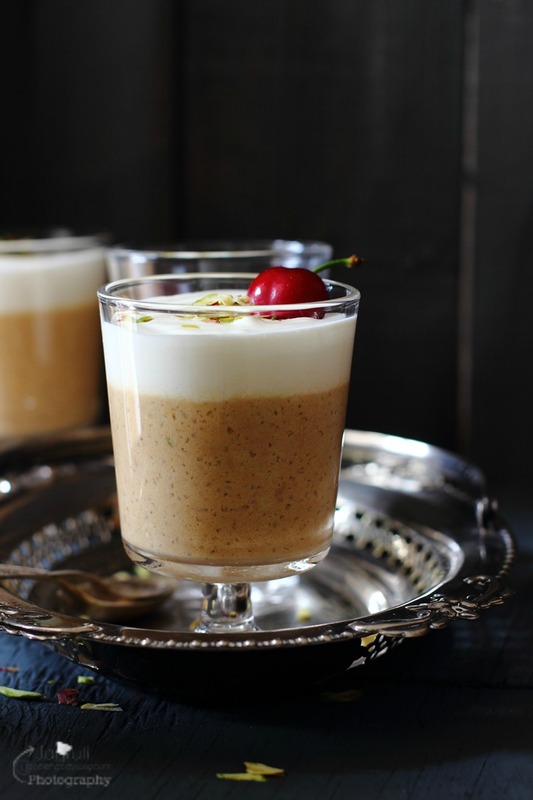 This creamy and scrumptious, caramel phirni make a great dessert, served in a individual glass looks so pretty. So if you are looking for a simple yet treat with a super delicious twist, I've got you covered. Put milk and half cream in a thick bottom sauce pan over a medium heat. Mix in ground rice and stir continuously. Keep string while bringing to the boil. Mean while in another non stick pan, add sugar and couple of spoon of water over medium heat. Allow sugar to dissolve and bring it to boil. Let the mixture caramelize and wait for it turn to dark brown. Do not stir, just swirl the pan.As soon as caramel dark in colour, remove it from the heat. Carefully pour the caramel mixture into rice and milk mixture, be careful as this mixture will bubble violently. Keep whisking constantly , and simmer until any clumps have dissolve and mixture is smooth. By now phirni mixture will be creamy and thick. Turn off the heat, let the mixture cool at room temperature. 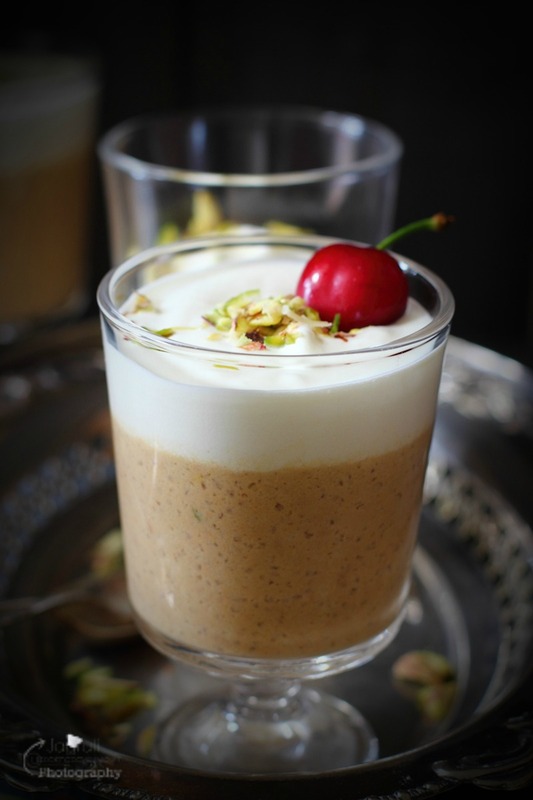 Once cooled, set the phirni in a individual serving glass, and let it cool in the fridge for 2-3 hours. 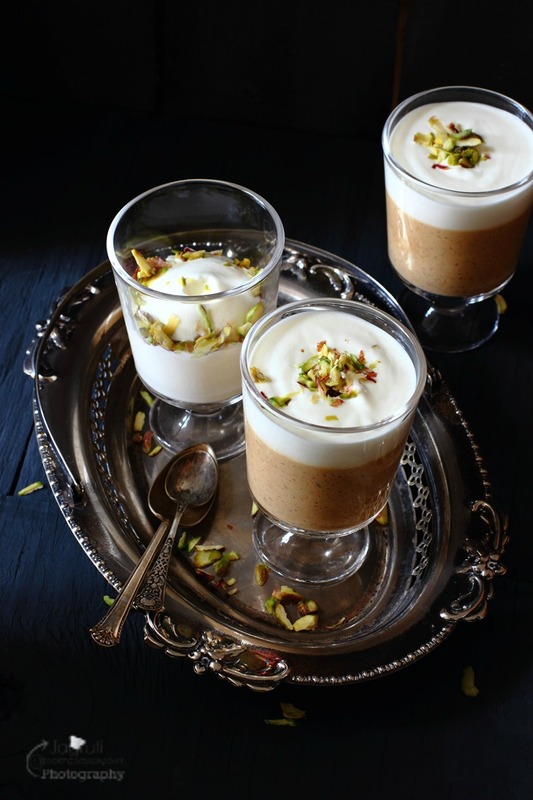 Once you are ready to serve, whip a remaining cream, pour on the cooled phirni and garnish with the pistachio slivers. If you fancy, add fresh fruit too. Absolutely delicious! I think it's a fantastic combination and your photos are amazing! Thank you Azlin for visiting and kind words ! Absolutely stunning photography! The Dad's in your life are happy with this beautiful dessert, I'll bet! I love, love, love Indian desserts. My all time favourite is obviously gulab jamun (whose isn't?!) BUT this looks fab. My Dad and I are huge fans of Indian food so this would be the perfect way to end a fathers day dinner for him. Thanks so much for sharing! Thank you Emmyw..wow, glad to know that you love Indian desserts too. We are a Gulabjamun lover family too. Do check out my other Indian recipes..have a great day ! Thank you Jolina for visiting and lovely words. Please do try sometimes ! 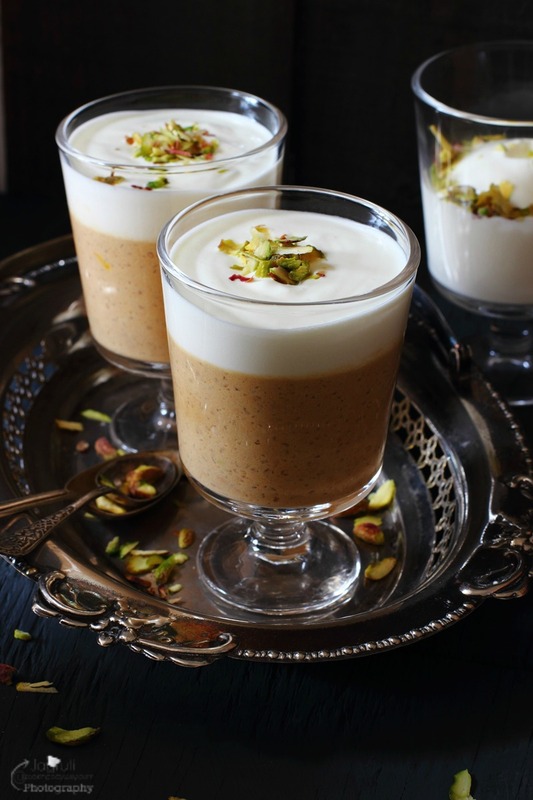 I love phirni! This is a nice twist to traditional which sometimes can be over sweet. Caramel will add a nice flavor here.. Well done! Thank you Suchi for visiting and lovely words. How very innovative to add caramel to this traditional Indian dessert. It looks delicious.